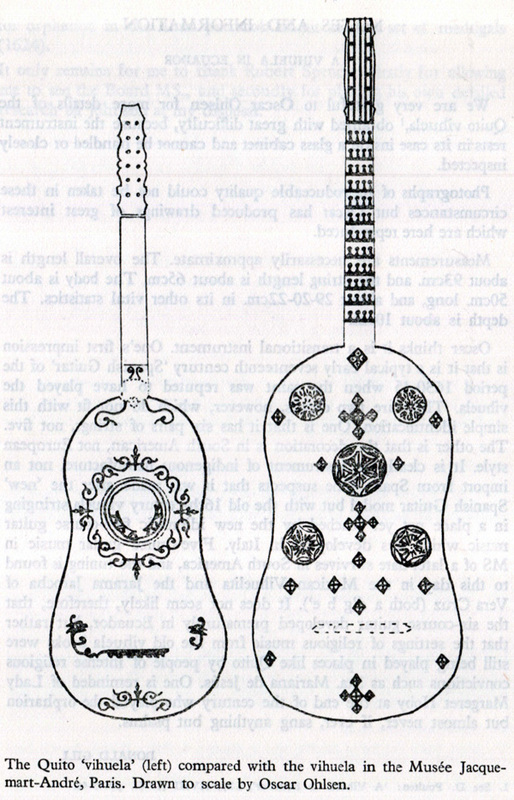 A Vihuela de Mano of the 16th century. . . 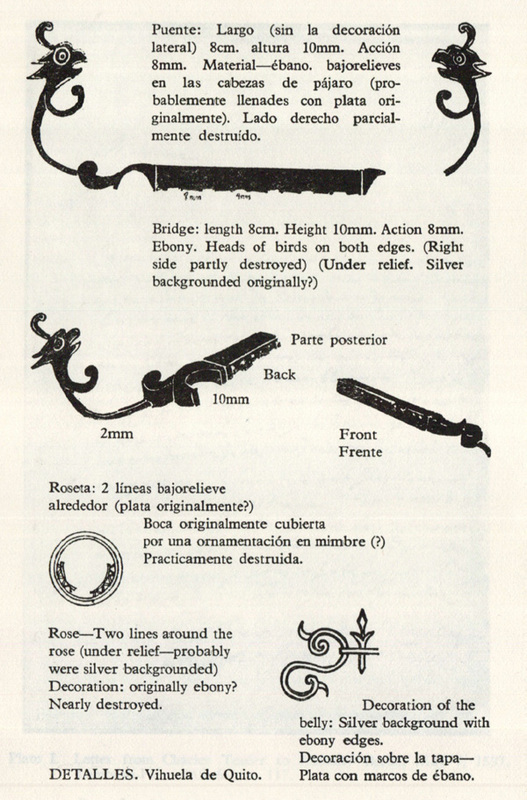 The following is my research for the commencement of a commission for a vihuela. I will develop my own drawing based on iconography and a study of the three surviving examples. 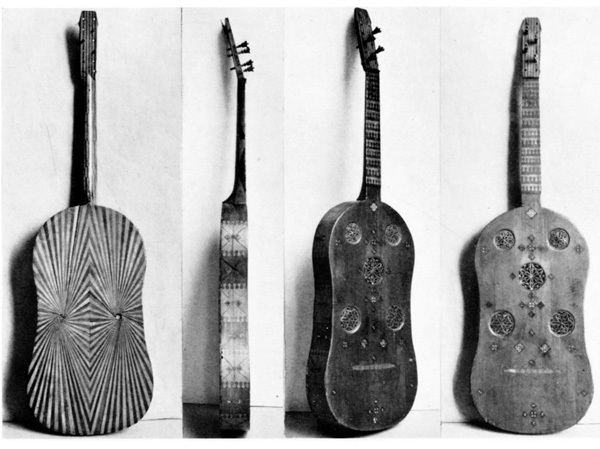 "In the Muse Jacquemart-Andre of the Institut de France, 158 Boulevard Haussmann, Paris, there is an extremely interesting old instrument which has all the appearance of being a Spanish vihuela de mano. . ." This is the beginning of the first scholarly article written about the instrument which has come to be known as the "Guadalupe" vihuela. So called because of an inscription on one side of the headstock. The article was written by Michael Prynne for the Galpin Society Jounal in 1963. The back is constructed not of veneers on a common plate but solid strips of wood which are 4mm thick at the top and 5mm thick at the bottom. The ribs are 7.2cm deep and not much more than 3mm thick. The back is reinforced with three bars. Two about 9mm square in section and located 18 and 43cm from the bottom. The third is 13mm wide by 5mm deep and crosses the back at the narrowest part of the waist at 30cm from the bottom. At each bar location there are blocks at the rib which are 14mm wide and 7mm deep. The top is pine at just over 3mm thick at the bottom and slightly more than 2mm at the top. There are five roses made of cut parchment. There are two soundboard bars, one about 6mm wide and 20mm deep with its lower edge at 35cm from the bottom of the belly. The second is about 6mm wide and 16mm deep at 46.5 cm from the bottom. 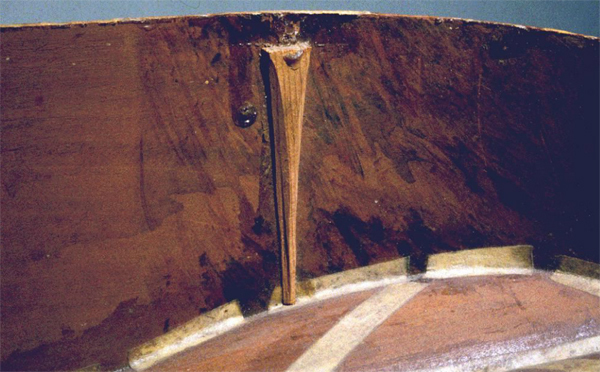 The bridge is missing but its leading edge would have been at 16.4 cm from the bottom of the belly It was 14cm long and 10-11mm wide, "with tapering ends each finishing in a small round knob." It carried five pairs of strings, so the other speculates it was converted at some point to a 5-course guitar. There are traces of a future bridge with an upper edge at 12.3cm from the bottom. The current bridge position gives a string length of about 76cm, allowing 9 frets on the neck. The earlier position indicates a length of 80cm, suggesting an f' tuning. Body length: 58.4 - Width at upper bout: 29.8 - Width at waist: 25.7 - Width at lower bout: 32.8 - Length of fingerboard to nut: 34 - Width of neck at nut: 4.5 - Width of neck at body: 5.5 - Thickness of neck at nut: 2.2 - Thickness of neck near heel: 2.5 - Length of head: 17 - Maximum width of head: 5 - Upper roses 5.8 diameter 6.8 form centerline and 50 from bottom - Cnetern rose 7 diameter, 40.5 from bottom, lower roses diameter 6.8 at 7.4 from centerline and 28.6 from bottom. Following two pages form the 1978 Lute Society article written by Donald Gill, based on the field work of Oscar Ohlsen of the "Quito" vihuela. 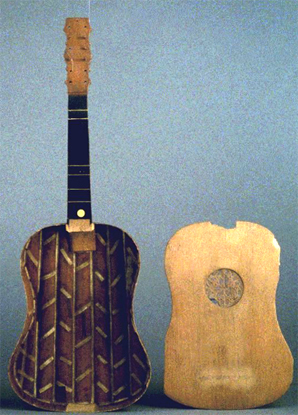 The geometry of the Belchior Diaz guitar, 1582, Accession No. 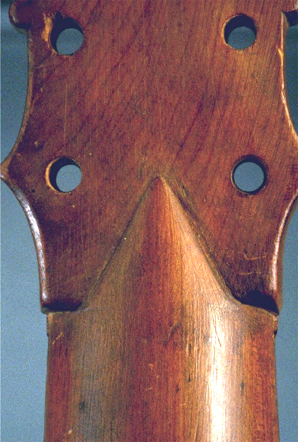 171 in the Royal College of Music, shown in Kevin Coates' 'Geometry, Proportion and the Art of Lutherie.' There is debate over whether this is actually a vihuela, but I am drawn to the body shape and may scale it up to the G-pitched instrument we are after. The following are study images of E.0748 from the Cité de la musique collection, Paris. I am less attracted to this instrument because of the wide proportion. 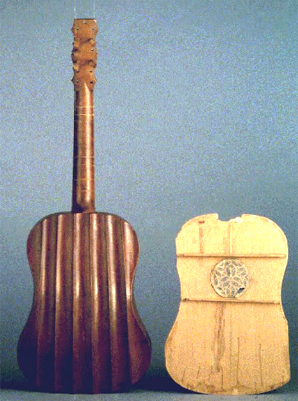 Unlike so many typical early spanish guitars and indeed the two other surviving vihuelas this instrument does not have a continuous block/neck/peghead. However the peghead shape is strong. 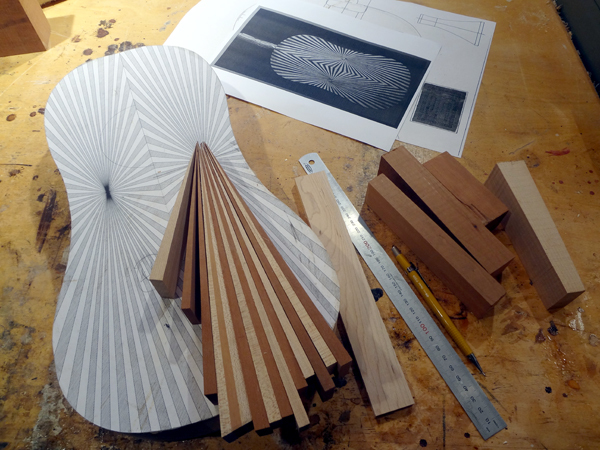 I will not be making a fluted back instrument. I note the simple barring and the taperd bar plinths on the sides. Steven Barber says this instrument - indeed all 4 instruments under consideration - has a one-piece heel/neck/peghead. But it looks like two pieces to me. The debate for me is more aesthecic: Do I want to have a peghead veneer, necessary if it is made in two pieces, or do I want the more unadorned look of this instrument. True, the joint is not expressed on the face of this instrument, but based on the grain of the back and the presence of the v-joint it feels like two pieces. The Dias guitar has the same v-joint carved, however study photos of show continuous grain direction between the neck and peghead. 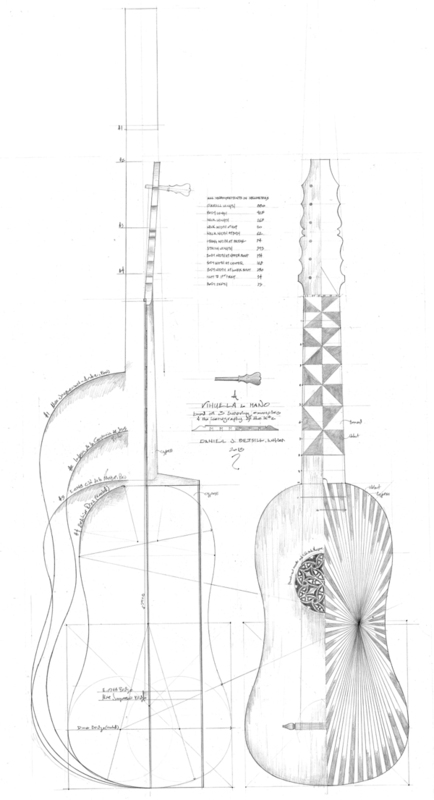 I also note that Maish Weisman's 1974 reconstruciton of the Guadelupe vihuela - suppoedly based on careful study of the original instrument and documented in Galpin Society Journal 35 - has a seperate neck and peghead. A couple of details from the iconography, from a painting by Juan de Juanes, in the Convento de Santa Clara, Valencia. 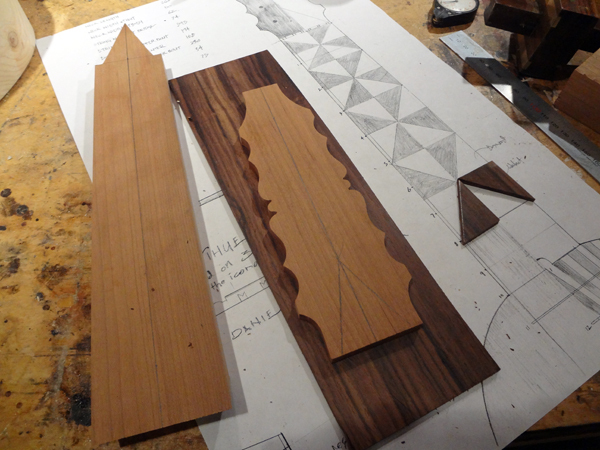 I want to do some kind of marquetry that will set the instrument apart form the later guitar detailing. And looking at the peghead from Luys De Narvaez. 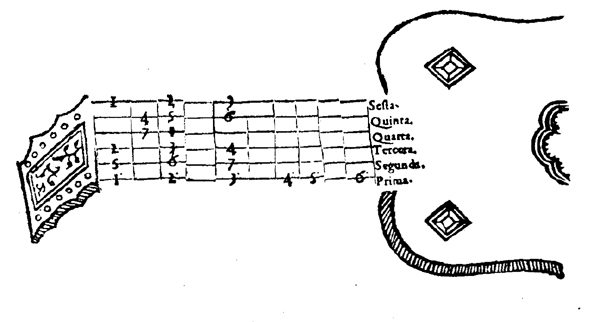 The fretboard diagram from Libro de Cifra Nueva para Tecla, Harpa y Vihuela by Venegas de Henestrosa, 1557. I've noticed that a lot of the diagramitic iconography has pointed peghead shapes, like this and the Orpheo woodcut. 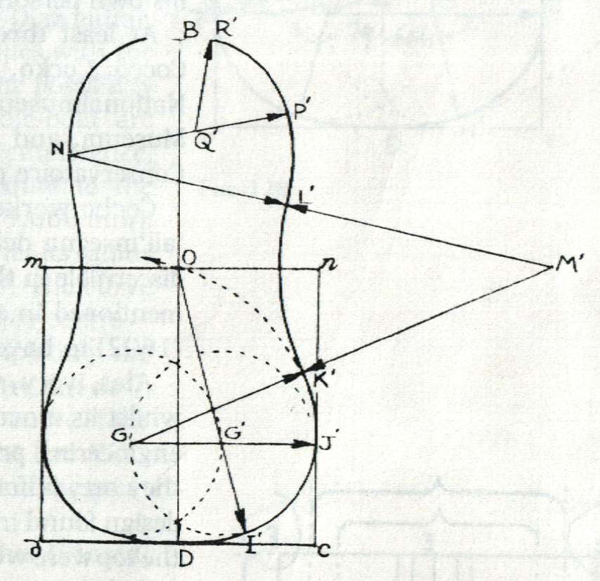 My drawing, showing the body outlines of the three surviving examples and the scaled-up geometry of the Dias guitar. 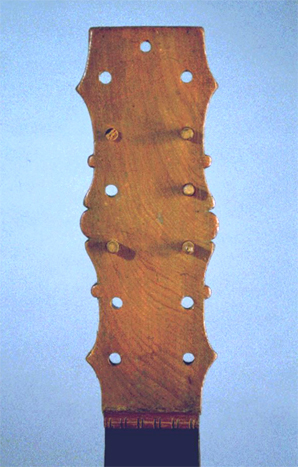 my instrument is this shape, with a string length of 59.5 cm for a G tuning and I have borrowed the back of the Guadelupe instrument. The peg shape is my own, echoing the profiles of the peghead. The rosette is that of the Cité de la musique instrument. Finally getting to build my first vihuela. 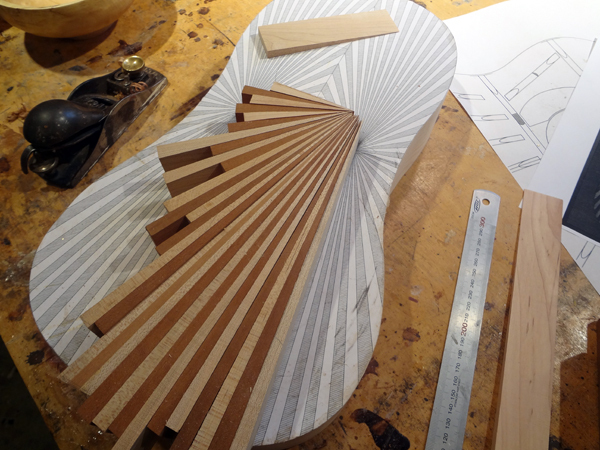 The construction is fairly identical to the baroque guitar I make so the real challenge is the back, replicating the Guadelupe instrument. My main reason for wanting to do this back is to see through an idea of making this design with a double bookmatch. So instead of making it as a mirror image about the centerline as the original Iwill make only one-quarter of the design and match it twice. Thus the thickness of my blanks which will get sawn in half, then sawed again. 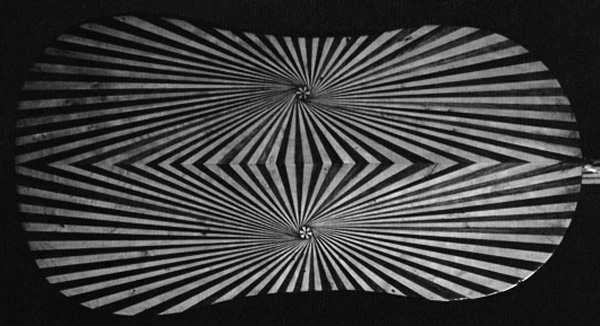 Taking a closer look since I made my first drawing, the staves are not converging to a point but radiated as a pinwheel. To make my "one-quarter" layup Iwill have to have them converge as a point. What I've quickly learned though is it is impossible to get the laminations to do this - at least beyond my woodworking skills. But it is the overall impression of the diamond design I am interested in and not a direct copy fo the original, so Iam willing to make this design concession to see my construction idea through. Iwill simply place a small rosette over the sure-to-be-asymmetrical convergance point. 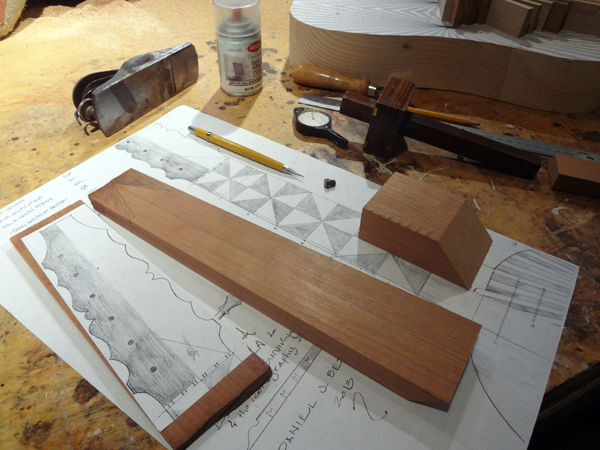 Making the blanks for the neck, heel and peghead. This is quartersawn "Southern" Cherry. I started making the back with a piece of mystery wood from my decades-long collected wood bin, thinking it was some kind of odd African wood. I took it to Richard at Carlton McClendon for identification and to get some more for the rest of the instrument, only for him to identify it as a piece of cherry. I thought it was unusually dark for cherry. He said the wood tends to be darker the more south you go. Peghead complete and face veneer selected. Starting to cut the pieces for the fingerboard. The heel is shaped and attached with my usual brad-nails-and-epoxy treatment. 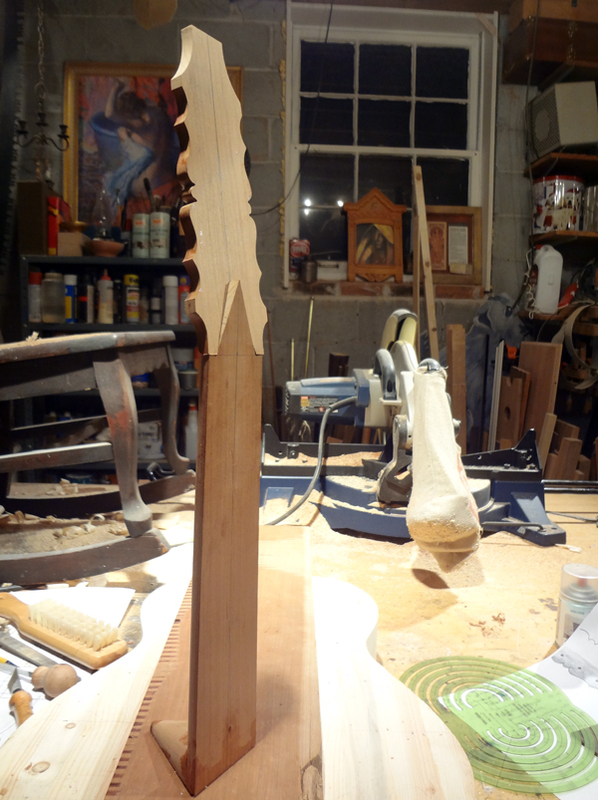 Doing a test fit of the neck joint. . . .more to come. 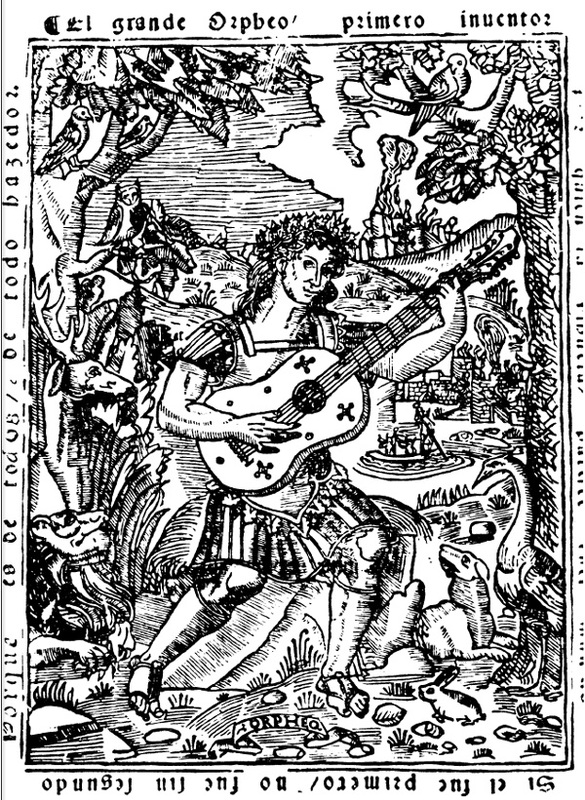 . .
apparently solitary survival is the more remarkable when it is considered that in sixteenth-century Spain the vihuela de mano largely took the place of the lute, though both lute and guitar were well known there. 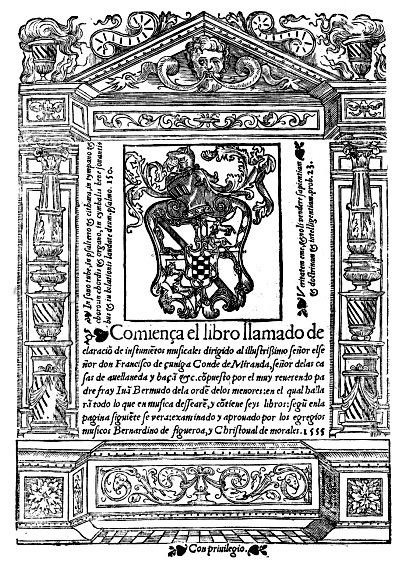 That its use is widespread is shown by the fact that a considerable body of music was not only composed for it but put into print." The back is built up of alternate sectors of dark and light woods. These sectors are not veneers mounted on a solid back but constitute its whole thickness, which is 4 mm. at the top and 5 mm. at the bottom. This form of construction must have been exacting work, but cannot be regarded as wholly satisfactory as any shrinkage in the wood inevitably causes cracks to appear; in spite of this, however, it can be seen to have survived remarkably well. "We are very grateful to Oscar Ohlsen for more details of the Quito vihuela, obtained with great difficulty, because the instrument rests in its case inside a glass cabinet and cannot be handled or closely inspected. . .Measurements are necessarily approximate. The overall length is about 93cm and the string length is about 65cm, The body is about 50cm long and about 29-20-22cm in its other vital statistics. The depth is about 10cm"
"The whole inside of this church is covered with pure gold, a striking contrast to the poverty of the people outside. The vihuela is in a very bad state, with the peg-box badly damaged and the rose broken. It shows no signs of restoration. It is an instrument of six double courses and, I should think, was made at the end of the 16th century, either in Spain or Quito. it belonged to Santa Mariana de Jesus of the Compania de Jesus, who died in 1645. I believe she was born in Equador, of Spanish parents, but I have no exact details." 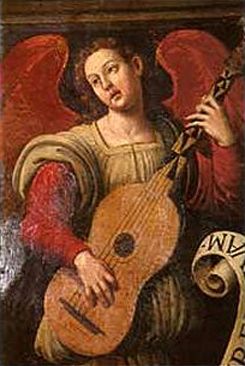 "One's first impression is that is a typical early seventeenth century 'Spanish Guitar' of the period 1630-45 when the saint was reupted to have played the vihuela. There are two details, however, which do not fit with this simple identification. One is that it has six pairs of strings, not five. The other is that the decoration is in South American, not European style. It is clearly an instrument of indigenous manufacture, not an import from Spain. 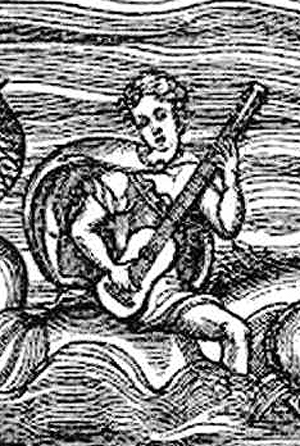 One suspects that it was made after the 'new' Spanish Guitar model but with the old 16th-century vihuela stringing in a place not yet reached by the new idiomatic five-course guitar music which was developing in Italy."